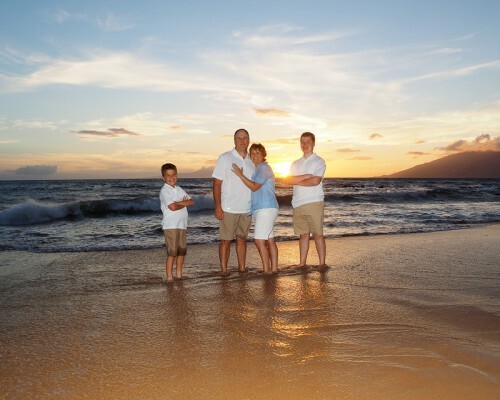 Maui family photography & weddings occur often here on this tropical isle. After all, it is a near perfect setting for capturing those special keepsake moments. 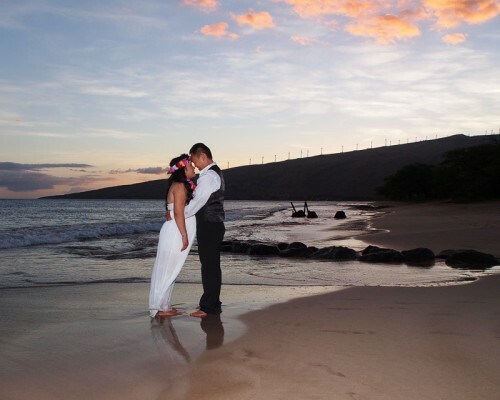 Both family and wedding photography in Maui is very popular. The natural environment of ‘The Valley Isle’ is an ideal location for a memorable marriage ceremony. It is also an excellent place to photograph family vacations, gatherings or reunions, couples on their honeymoon or anniversary, individuals needing senior or corporate portraits or as additions to their own personal portfolio. Most all of the images contained in this site occur within Maui Island Portraits’ normal service area which is covered in the one-time all-inclusive photo shoot activity fee. (Locations outside the normal service area, and for which an additional fee is charged, can be viewed in the sub-menu of this Services page). Initial Consultation to ensure all your questions are answered regarding what to wear, what time and where to meet, what to expect, when you will receive the finished product and any other information that can be helpful in making your photo shoot activity a fun, enjoyable experience. A scheduled professional photography photo shoot activity with an experienced and friendly Maui photographer, at one of Maui’s premier locations, in the early morning, or late afternoon during the sunset hour. At the beach during sunset is the most popular and there are several excellent beach locations to choose from. Sunset beach sessions begins about an hour before actual sunset, which varies throughout the year between about 5:30pm in winter to 7:30pm in summer. Morning photo shoot activities generally begin as early as 7am, and no later than 9am. Most photo shoot activities go from 60-90 minutes. Precise editing can be an important aspect of producing the best possible quality image. After the photo shoot activity, the images are downloaded to a computer and reviewed. A selection of well over several dozen of the best images are chosen and adjusted in professional photo editing software to ensure proper white balance, color hues, saturation, brightness and contrast. In some cases, special effects are introduced to a few specific images, such as water color or oil paint effects, or converted to black and white, or a vignette may be added. Each image is composed and cropped to produce the best composition. Each of the over several dozen images in your collection is carefully reviewed to make sure it is….flawless. A CD of your digital images mailed to your home*. The CD contains two folders, one with high resolution images suitable for printing, from small to very large sizes, and one with low resolution images more suitable for email, websites and social media. Both folders contain the same identical images. Each photo shoot activity results in at least several dozen distinct pictures in each folder. In many cases, there are quite a bit more, especially in families or weddings. Because each location offers several backdrop settings, we move around a bit and capture images at different spots in that one location. In the case of families, groups and weddings, there are shots of the entire group plus various shots of sub-groups and sub-sub groups as well as individual shots. This makes for a lot of pictures! You will be very pleased with the large selection of images in your CD collection. Visit the testimonial page to read what others have said about our services and product. (* United States. Mail to Europe, Asia, Central & South America, Australia and generally areas outside of North America will incur additional cost to cover increased postage fees). Complete printing and sharing rights to all images; you can post on social media and print as many as you like in various different sizes, at cost from your home printer or your favorite store or lab. Contained within the CD is a PDF document which states all your reproduction/printing/sharing rights to all the images on the CD. With this program, you are not limited to purchasing prints from the photographer. You have the digital files and you choose what you want to print, in what sizes and quantities, at your cost. A private, password protected online gallery with many features and options including social media sharing, prints, cards, calendars and other specialty items.